"We knew that the UN and NATO secretariats were drawing up an agreement," he said. "And we assumed that before the signing, its draft should be shown to the member states. But it never happened." The Russian minister said that he discussed the problem with UN Secretary General Ban Ki-moon. "I did not hear any reasonable explanations. 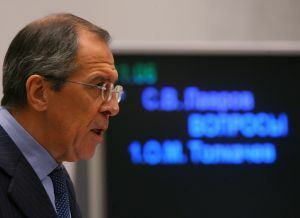 It surprised me," said Lavrov. "We asked the leadership of the two secretariats what it might mean. We're awaiting answers," said Lavrov. Russia's representative in NATO, Dmitry Rogozin, said that in the document there is not a single word on the UN's leading role in ensuring stability in the world. "NATO should fully acknowledge the UN's universal role and not try to substitute UN functions," he said.